BPSGMC Jobs Recruitment Notification 2018.Bhagat Phool Singh Government Medical College for Women inviting applications for the positions of specialty and super specialty posts namely Senior residents and senior resident jobs in pediatrics, neuro surgery, nephrology, cardiology, microbiology, forensic medicine, skin & VD etc departments.Interested and Eligible candidates can apply for the positions. Total number of vacancies to be filled in BPS GMC is 63. MD/MS/ PG holders in relevant subject can apply for Senior residents and demonstrator jobs. Along with all essential documents and application form candidates may appear for the interview on 21st September 2018 and on every Friday till the vacancies fills up. Office of The Director, BPS Govt. 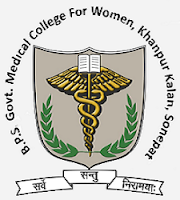 Medical College for Women, Khanpur Kalan, Sonepat.